I’m writing a book that is both a memoir and a work of social history. I grew up in New Haven, Connecticut, and lived in one of the city’s eight housing projects. My family lived in the projects, Eastern Circle, from 1960, when my grandparents moved in, until 2000, when my last relative left. When I was a child, it was a wonderful place to live. There were 142 families living on 23 acres of land—an all-black community where we all knew each other and took care of each other. My grandfather was without a doubt the center of my family. My grandmother and my grandparents’ seven children and dozens of grandchildren revolved around him. He was the most nurturing person I knew. My grandparents’ house was filled with plants that he tended to all year round, and every summer he grew a garden. It was the only one in Eastern Circle. The projects were set on a long, sloping hill. My grandparents’ apartment building was at the bottom of the hill, and the building I lived in with my mother was all the way at the top of the hill. As I would approach my grandparents’ house, I could see the garden coming into view—corn in the back rows, and as I got closer, marigolds and lilies surrounding the garden, and the climbing rosebush my grandfather had strung over the porch awning and along the living room windows. Eventually I’d be close enough to see the tomatoes, eggplants, squash, collard greens, and onions. I loved that garden. A lot of other people in the projects did, too. When I was fourteen years old my life in Eastern Circle changed completely. On June 11, 1987, there was a fight outside. A neighbor knocked on my grandparents’ screen door and said, “The kids are getting into it––which meant my grandparents’ eighteen-year-old son Dean was outside fighting. My grandfather went outside to break up the fight. Soon after, one of Dean’s enemies pulled out a gun and shot into the air. Our neighbors watching the fight—adults, teenagers, and kids—started screaming and running (I wasn’t there but have since talked to people who were). My grandfather made his way over to the young man with the gun, held out his hand, and said, “Give me the gun.” The guy shot again and the bullet skidded along the pavement. My grandfather didn’t step away but instead moved closer. For the third time the gun went off. This time my grandfather was shot in the chest. He died within the hour. My family suddenly had to figure out how to survive without him. We had to figure out how to guard against our complete and utter ruin as a family. And the only way we could manage was by remaining silent. For twenty-five years we did not talk about my grandfather—not his life, not our good memories of him––and certainly not about his death. It has only been in the last few years, because of my writing, that we have started to talk about him and his murder. During this time I found out that the fight my grandfather was breaking up was a quarrel over drugs. I had always thought of his murder as an isolated and random tragedy, a horrible choice made by one person––the shooter. But now I’ve come to see his murder as part of a larger story. In the late 1980s the rate of violent crimes began to rise throughout the United States. The vast majority of these crimes were attributed to the illegal drug trade and were predominantly acts of gun violence. Black people were disproportionately represented among the victims. This trend was apparent in my hometown of New Haven as well, where the murder rate reached an unprecedented level. In an article entitled “Out There,” journalist William Finnegan reported that in 1989 there were 320 shootings in the city and 34 murders—more murders per capita than in Chicago, Los Angeles, or New York. Finnegan and nearly everyone else who was studying and writing about the violence in New Haven attributed it to poverty. According to the 1980 census, New Haven was ranked as the seventh-poorest city in the country. The unemployment rate for adults was 30 percent and for youth, 50 percent. The location of the city is also important to the illegal drug trade. It is only two hours from New York City, and dealers can get large quantities of drugs easily. Eleven suburbs surround New Haven, and most of the people who live in these communities are white and middle-class or wealthy. It was these people who flooded places like Eastern Circle to buy drugs. As a consequence, someone like my Uncle Dean could make up to a thousand dollars a day selling. And that’s exactly what he did, along with other young men there. In a very short time, Eastern Circle changed dramatically. As I write, I let my questions lead me. One question brings me face to face with another and then another, and I’m sure that even when I finish the book, I will still have questions. I started out asking my grandmother about her life as a young woman—a much easier place to begin than talking about my grandfather and his death. She showed me the first photograph she and my grandfather ever had taken together. It was in a photographer’s studio, and she was sixteen years old and he was twenty-two. As I stared at the photo all I could think was––they’re an adorable couple. I turned the photo over and saw that on the back my grandmother had written: “My future husband.” Those three words led me to think more about her as Louise Whitaker and my grandfather as James Allen, Jr. I could almost feel how hopeful they must have been about their life together. They were leaving the South––Nashville, Tennessee, and Selma, Alabama––coming north to Connecticut. Years later they would move into this housing development, Eastern Circle, where every wall, floor, door, and appliance was brand-new. Since then I’ve become interested in how broader events like the Jim Crow laws, the Great Migration, the federal housing acts that created housing projects, the loss of manufacturing in the North, and the black power movement and the backlash to it shaped the experiences of my family. Having a better understanding of these events helps me to consider why Eastern Circle changed from a housing development in the 1960s that was racially integrated and filled with working-class families to one in the 1980s that became so troubled that federal intervention was necessary. I can also begin to recognize the drug trade in Eastern Circle as part of a global system that included farmers who grew coca leaves, chemists who processed the drugs in labs, and distributors who shipped the drugs to the United States. I don’t attempt to tell the history of all these events in my book. But I let them inform my thinking, and when necessary I place the people I’m writing about in relation to these events. I do this because I believe that my family members and former neighbors made choices—about how to raise their children, make a living, and create lives that had dignity––within the constraints of social, political, and economic systems. I know that what happened to my family and to Eastern Circle had to do with decisions being made far and wide. This is important for me because otherwise the drug trade and the violence that came along with it would seem inevitable . . . and that was not the case. Here is a brief excerpt from my writing that has grown out of conversations I’ve been having with my Uncle Dean. In this excerpt my grandfather is called Dada. The bullet smacks into your side, close to your waist, and it feels like something wide and heavy hit you. The bullet in your leg is crackling, growing, has an anger of its own, but that can’t be right. A bullet rips into your back, splits open your skin. A bullet pierces your shoulder; your eyes water, you’re warm, weak. Bullets hit your chest, draw you backward. You grab at your throat and try to breathe. The first time Dean is shot, the bullet lands in his left leg. When he makes it to the hospital, a security guard handcuffs him to the bed. He goes to jail that night—an outstanding warrant for disturbing the peace. After he’s locked up for a few days, the bullet comes out and falls right onto the floor. Clink! He rubs the lead casing and copper-colored bullet between his fingers, and it’s smooth and damp. It smells rank, but its shape is perfect. The bullet feels like a part of him, almost more than anything else. He wipes it off, wraps it in tissue, and mails it to his mother. After Dada’s murder, Dean is shot on Day Street, on Russell Street, in the Ville, and other times in Eastern Circle. He doesn’t back away from the dark knuckles, the dirty fingernails, and the black muzzle of the gun. Once he knocks a gun out of a guy’s hand. It goes off. The bullet grazes Dean’s right leg. He runs, limps to his friend’s house right across the street from where he lives. They can’t slow the bleeding. His leg shakes. He’s dizzy. Blood’s smeared on his chest, in his hair. It’s staining everything around them. Another night he’s down the hill in Eastern Circle, near the administration building, when a guy walks up to him and fires. Dean beckons death but fights it, too—he has on a bulletproof vest. He takes five bullets to his chest, and his skin burns and bleeds under the stiff fabric and metal plate. The shooters don’t do drive-bys or wear masks, so Dean sees their faces, clamped down and determined. The guns, an extension of their hard feelings, give off a dazzling flash, a faint puff of smoke. They’re paying him back for whatever he’s done, probably robbing them or someone they know at gunpoint. Fragments and whole bullets are lodged in his body. From his shoulder to his legs there is crushed tissue, damaged muscle. Soft, swollen scars cover his skin. Anyone who looks can see that he’s marked. Wounded. We all took something of Dada’s. I see his plant every day. My grandmother has his wedding ring. My mother picked his tackle box. My Uncle Wayne kept his caps and set them along a shelf in his closet. The bullet that ended Dada’s life never belonged to him, but that’s what Dean chose—the bullet. Every time Dean is shot, it’s like he’s getting hit with the same bullet over and over, the one that killed Dada, the one that won’t kill him. 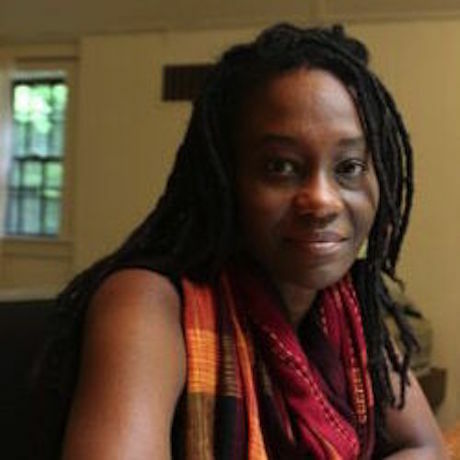 Catina Bacote’s nonfiction has appeared in The Gettysburg Review, The Sun, The Common, Heart & Soul, The Southern California Review, and Trace: Transcultural Styles + Ideas. She wrote a companion guide to the documentary Banished: American Ethnic Cleansings and has received fellowships from the MacDowell Colony, the Millay Colony, the New York State Summer Writer’s Institute, and the Gilder Lehrman Institute. Catina holds an MFA from the University of Iowa, where she was admitted as a Dean’s Fellow and subsequently served as the Provost’s Visiting Writer in Nonfiction. She is a professor of creative writing at Warren Wilson College.